And hands. And arms. All in the cause of taming Rambling Rector. An annual task, like so many others in the garden. And this one falls to She Who Must Be Obeyed, who is so very good at it. Poor Rosie, it takes her several days of snipping and tidying, of manoeuvring ladders and dicing with death, and all the while being attacked by the slings, arrows and thorns of the rectorship. Not that I’m sure it’s actually Rambling Rector…there are quite a few very similar roses and it seems to be impossible to tell one from another. Just as it seems impossible to tell how it got its name, even if it is. Presumably it was a prelate with a wandering eye, or maybe a shambling gate. Who knows. Who cares. 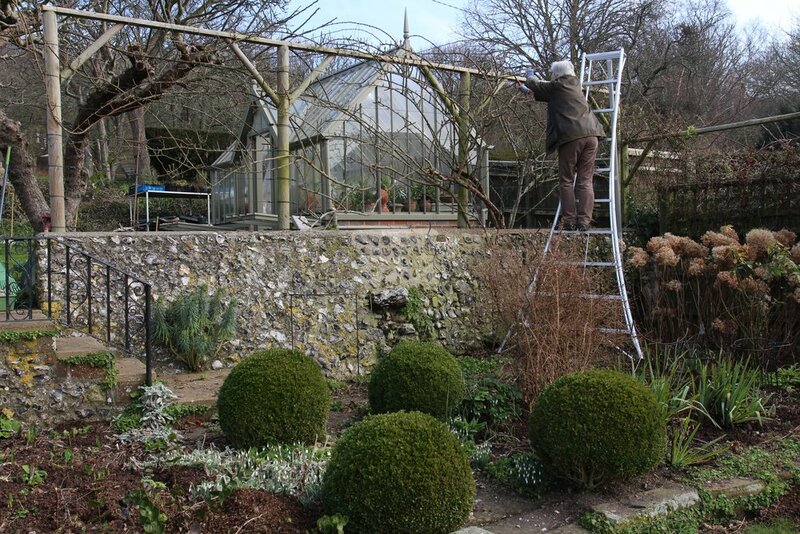 While the Rector is undressed so to speak you may be interested to see how I string it to the trellis: rather than use garden wire (which is nigh impossible to tighten neatly) I use Gripple tensioners, the nylon wire they supply and where necessary vine-eyes. Gripple first supplied agricultural tensioners but now, thankfully, they’ve produced a domestic version which I’ve used in the garden wherever I’ve needed to string a wire…for the raspberries, the trachelospermum climbing up the side of the house, the Veilchenblau up the garage and clematis in various places. Their website explains all (www.gripplegarden.com) and they’re very helpful if you have a query. Which you shouldn’t have, as gripples are incredibly simple to use, and dead useful. 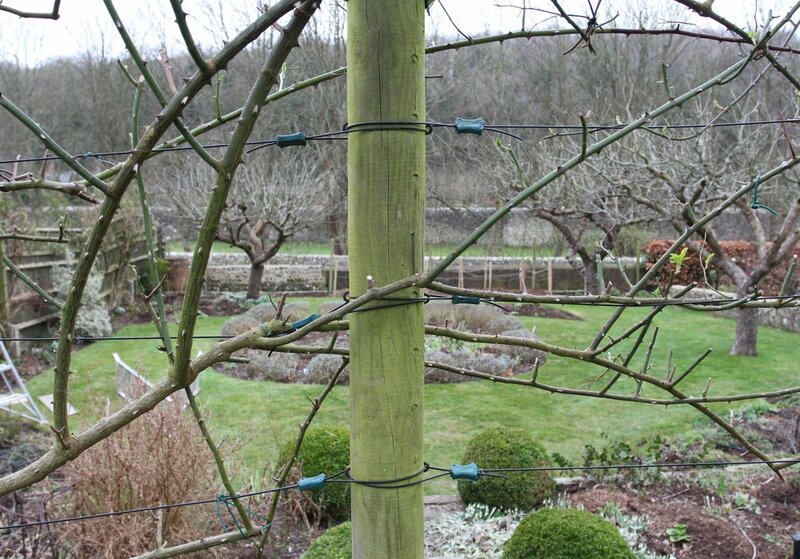 Talking of trellis, I’ve got a major gripe about fencing posts. Once upon a time garden posts were tanalised to preserve them and they used to last for ages in the ground. Now however, because tanalising contained arsenic, garden posts are pressure treated instead and although come with a suggestion they’ll last for a decade I can tell you that some of mine have rotted after just three years…and that’s in our free draining soil, not soggy clay. When I replace them I’m going to dip them in a strong preservative in the hope that’ll give them a longer lasting life. Maybe I need some divine help from the Rector.